We are pleased to announce the availability of another set of new features for Red Hat Gluster Storage 3 with the fourth update since version 3 of the open, software-defined storage solution first became available in October 2014. Today's news comes on the heels of our announcement of a unified open software-defined storage portfolio that brings together Red Hat Ceph Storage, formerly known as Inktank Ceph Enterprise, and Red Hat Gluster Storage, formerly known as Red Hat Storage Server. These new features are designed to enable enterprises to achieve greater performance for many workloads, while increasing flexibility around deployment and replication and have been heavily requested by many users of Red Hat Gluster Storage. Generic file workloads typically deal with file sizes that vary wildly, so file services must perform well for workloads with all kinds of files - small, medium, and large. This is the first wave of small file performance enhancements to Red Hat Gluster Storage to improve performance for workloads that deal with small files or small I/O transfer sizes on large files. Many current Red Hat Gluster Storage users have deployed in environments, like the public cloud, where a volume’s standard 2-way replication may not provide enough resiliency. Many users would also prefer to reduce complexity and increase availability by avoiding the use of RAID. This latest release of Red Hat Gluster Storage provides an alternative by introducing 3-way replication with support for JBOD. Three-way, synchronously-replicated Red Hat Gluster Storage volumes save three copies of every file to provide higher data availability and local recovery for business continuity. These volumes work with other data services like quota, asynchronous geo-replication and snapshotting. While RAID is recommended for 2-way replicated volumes, the new 3-way replicated volumes do not require hardware or software RAID. Our lab tests show that sequential I/O workloads that are read-heavy and multi-threaded benefit most from using 3-way replicated volumes, where the reads get served from more replicas. Additionally, these new volumes are self-healing – when nodes experience temporary outages, their data automatically re-synchronizes when accessed. In the public cloud, the new 3-way replication in Red Hat Gluster Storage can be used to protect against failures in up to two availability zones. Support for JBOD ("Just a Bunch Of Disks") enables servers with up to 24 disk bays to be used without requiring the performance overhead of advanced RAID protection. The newly-introduced 3-way replication has been designed to work with JBODs, and is the recommended and supported replication configuration for them. All the recent, dramatic small-file performance improvements arise from what is called the "multi-threaded epoll feature." On the server side, multi-threaded epoll relieves saturation by creating additional threads to process network requests in parallel from clients. This drives the storage nodes to make the disk subsystems process requests more quickly than possible with one thread. On the client side, multi-threaded epoll causes responses from the storage nodes to be processed concurrently. As a result, wait times on application requests drop significantly, resulting in higher throughput. As a result of this enhancement, systems with multiple cores will enjoy improved core utilization. Because of the client-side improvements specifically, in our tests we have seen across-the-board performance improvements for nearly all multi-client, multi-threaded workloads, and even some single-threaded ones. Applications needing high Input/Output Operations Per Second (IOPS) with SSD bricks will also benefit. Remember: this is just the first wave of small-file enhancements. We plan to deliver additional enhancements in upcoming Red Hat Gluster Storage releases to continue improving the performance of small-file workloads. A rolling upgrade to this release is possible and we would encourage customers to do so to take advantage of these enhancements. 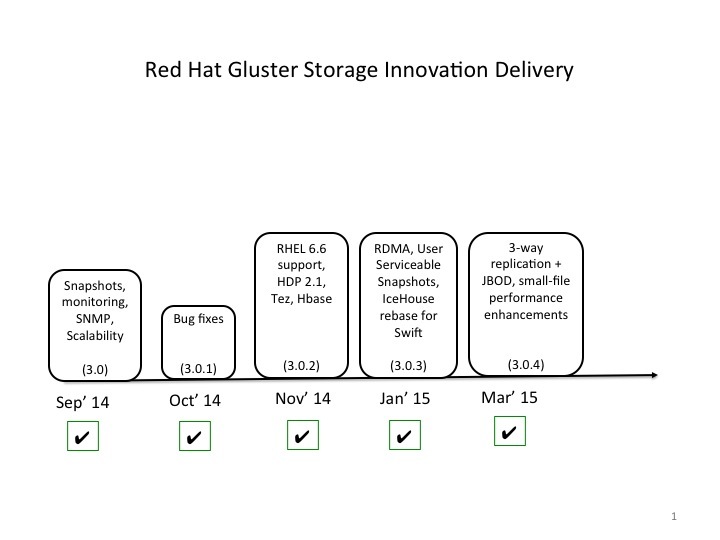 The following graphic provides a chronological display of feature delivery for Red Hat Gluster Storage 3 release since it’s GA in September 2014. We are excited to deliver these new features to our customers. For more information about Red Hat Gluster Storage, visit http://www.redhat.com/en/technologies/storage/gluster. For more information about the Red Hat Storage portfolio, visit http://www.redhat.com/en/technologies/storage.